The reason many in business and government are skeptical of research is that many of them use “pimped opinion” as a substitute, and so they find it hard not to assume everyone else does. Especially lobbyists. Part of content curation such as I do with this blog and that I practiced during my now-concluded 40-year career as a community-destination marketing (DM) exec is to look carefully behind a study to make certain it was produced and vetted by experts and if possible peer reviewed. Of particular concern are so-called white papers often promoted by partisan think-tanks where even more careful scrutiny is always warranted. The DMO in my adopted home of Durham, North Carolinas has earned a reputation for objective analysis based on sound data. This should never be taken for granted. It can be lost in heartbeat if not deeply entrenched in organizational culture and governance and insulated from anecdotal whimsy. The exceptions are businesses such as outdoor billboard companies, where any value is wholly reliant on governmental decisions and regulations regarding tax payer-funded roadways and other government-dependent industries such as defense or those heavily regulated in the public interest such as utilities. If the failure of massive injections of anonymous corporate donations into the election process wasn’t enough to confirm that these dollars were an unwise wise investment, Coates’ data added an emphatic exclamation point. Highly threatened, the U.S. Chamber of Commerce (not to be confused in any way with local chambers of commerce) immediately dusted off a long-discredited white paper that had never been peer-reviewed and was produced by non other than a lobbyist. Unfortunately for too many casual observers, this meant “touché, all over again” and a “tie goes to the runner,” right? Fortunately, Professor Coates opened up with both barrels in a letter this month to the Securities and Exchange Commission. Coates’ findings undermine a pivotal assumption by the Supreme Court in Citizens United. Hopefully, SCOTUS justices have time to read and not just write. Regardless, the Coates study should be required reading for corporate shareholders and all C-suite executives. Late last fall, I decided to read three newly released books, all in the course of a week, to find relief from political campaigns. The Better Angels of Our Nature – Why Violence Has Declined by Harvard researcher and experimental psychologist Dr. Steven Pinker. I haven’t written about them until now because a few days after I completed Steven Pinker’s book, a twenty-year-old man killed his mother and then gunned down twenty school children, mostly first graders and six elementary school officials in Sandy Hook, Connecticut. My sixteen great-great grandparents were all of the same generation as U.S. Grant. They were born during a period of great awakening but by the time they entered adulthood, the nation had begun to unravel. When the Civil War broke out Grant was only 39. By the time he reached 46, he has saved the Union and been elected President of the United States. There is evidence that profiteering during the war, e.g. black marketeers following behind Union lines to exchange gold for southern cotton which was in turn used to by the Confederacy to buy weapons and supplies. You get the feeling from the book on Grant that he felt this extended the war by several years. There are many things in Durham, North Carolina, where I have lived for nearly 25 years, that remind us of the generosity Grant and Sherman planned as the huge surrender was negotiated here to effectively end the Civil War. But that was all reversed when interrupted by President Lincoln’s assassination. The ink was hardy dry on documents formally ending the war when Southern apologists effectively rewrote the history of the war as one merely about state’s rights. Many times during his two terms as President, Grant had to send troops back into Southern states to quell violence and safeguard elections. As soldiers from both sides fraternized during the surrender in Durham, they developed a taste for tobacco that had been cured and stored here. They wrote letters seeking more once they got home, which help launch factories that saved Durham from much – but not all - of the destitution and violence that inhabited the south after the war. Economic opportunity here also spawned a Black Wall Street and made Durham a beacon for racial diversity, which it remains today. When I arrived in 1989 to jumpstart the community’s destination marketing arm, my first business road trip took me eventually south on US 1 where I was stunned to see a huge NCDOT highway sign heralding a small town along the route as the home of the KKK Grand Wizard. Within a few years Dr. Cunningham started his masters degree at the University of North Carolina in Chapel Hill just south of Durham. His book in many respects helps me understand why that unusual highway marker was not only permitted to exist but enabled. According to Cunningham’s research, during the Civil Rights movement of the 1960s, the Klan’s stronghold was North Carolina, with more members than the rest of the South combined. Writing and presenting editorials for a Raleigh TV station at the time, the soon-to-become Republican Senator Jesse Helms was possibly the first in that party to discover how to inflame angry white men, and by the time I moved here, his campaign commercials even in the 1990s still seemed overtly racist. As Helms was readying his first campaign for the US Senate in Raleigh in 1971, CP (Claiborne Paul) Ellis, the head of the KKK in Durham, was joining forces with Ann Atwater, a poor African American civil rights activist, to put aside differences and improve public schools. Their story was published a half dozen years after my arrival here. He was born just off the route of what is I-40 today, about midway between Winston-Salem and Statesville and just west of Mocksville. He was apprenticed to a printer in Salisbury and in 1857 published a book with charts and graphs showing why slavery didn’t make sense for the South as an economic institution. 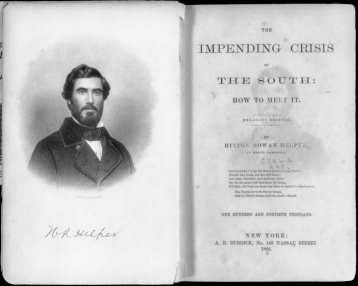 His book The Impending Crisis of the South: How to Meet It was distributed by the Republican Party as a campaign document and it branded Helper a traitor in the South. But in the end Helper too was still a white separatist as many were at the time who disavowed slavery. His book panicked the planter elite for fear this tiny fraction, who held power, would not only face a slave insurrection, a fear of which had spawned the Second Amendment right to bear arms, but an uprising of white yeoman farmers who opposed slavery but ultimately were destined to sacrifice the most blood in its defense. Ironically though, the right to bear arms also ended up as a protection for free and now freed Blacks who armed themselves following the Civil War and emancipation against the continuing tyranny when following Grant’s terms as President, the Republican Party turned a blind eye to the atrocities and became solely captive to its Wall Street wing. Today, it is the Republican Party that is more prone to try to manipulate voter rights. In fact, it may be the Party that saved the Union that is now ironically fostering another era of unraveling which cyclical historians project will lead to another another turn of crisis such as the Civil War or WWII by my mid to late 70s. It may have a happy ending as WWII did, or it may result in preservation of the Union but decades of unfinished business as the Civil War did. The cycle is predictable but there are no guarantees of the outcome as time can do so much. Collaborations are difficult because of what psychologists call the “availability bias.” Some people vet an idea when it first occurs to them. They don’t assume they are the first to have an idea or that they are expert at everything. Others just automatically assume their ideas are great because they occurred to them and set off to proselytize others. Unfortunately, this is usually at the expense of those with background and expertise on the subject by putting them in a corner. Elected officials and government administrators are particularly susceptible to those with “availability bias,” because politics not only is one of the few areas left where access to information is automatically assumed to be asymmetrical but there is an over-reliance on lobbying vs. keeping up with other information that is otherwise made readily available. You hear it in comments on the floor of legislative bodies when bill sponsors chide peers who ask for time to study lengthy bills by condescendingly directing them to sparse summaries or creating peer pressure to make decisions based only on “who’s asking.” This leads to democracy being representative only of a powerful few. Individuals with what cognitive researchers call “availability bias” not only make collaboration more difficult and complex, they often destroy any potential by pitting forces against one another. They can’t fathom such a thing as win-win. They either join collaborations in name only, leaving all the heavy lifting to others, or they politicize these groups before they are fully formed by creating opposing sides in an attempt to control the outcome or specific details. They have no patience for the interplay of ideas without dictating the outcome in advance. Occasionally during my now-concluded 40-year career as a community marketing exec, I would be frozen out of a launch or a grand opening that had been enabled, in part, by the organizations I led in three different communities when individuals who with whom I had tried to collaborate maneuvered officials to make sure I was excluded. With these people, raising questions about their pet projects is never tolerated even when I may have been in a position of more expertise. Decades ago I took part in a team-building workshop with a handful of other civic leaders in a community I represented that included a collaborator I realize now had “availability bias.” This included a very in-depth Myers-Briggs analysis that I wish I had kept at hand back then to better understand inscrutable interactions. I am an XNTX and this person’s inherent preferences made them an EXTJ. The first letter indicates where you get energy. I rated an X for borderline but I was actually slightly “I” for Introvert, making me more of an ominivert, someone who creates his own energy but is still functional for brief periods in settings where extroverts thrive. This associate was a strong “E” for extrovert, meaning this individual’s energy came from other people, an energivore, so to speak. The amusing illustration linked here explains introverts and omniverts to extroverts. My inclination as an introvert-leaning omnivert also explains my comfort at being more the “man behind the curtain” as a means of conserving energy. This means I almost always informed information gathered through the five senses with more of the “big picture” including concepts, relationships and meaning. On some days this person was on that page with me or would rely on me for the “big picture” when learning more to their sensing side. When we made decisions, this person was strongly “J” for judging or quick to make a decision based on only a few facets of an issue and greatly irritated if re-opening the decision became necessary based on additional information and data. The missions of our organizations were different. This person’s was narrow and more tangible. Mine was community-wide and dealt with understanding, integrating, balancing and influencing the values and perceptions of a broad range of fluid audiences both internal and external including those of this person’s organization and constituents. My world was always both/and and relied on collaborations and strategic partnerships while forces often dictated that my collaborator's were either/or and even zero-sum. All of this is to say that successful intra-community collaborations are often more dependent on the inclinations of those who lead them than the willingness of the organizations themselves. Communities seeking genuine collaboration based on mutual respect and what’s best overall vs. the zero-sum push and shove of personal politics or “availability bias” are well-advised to have its leaders undergo well-proven analysis such as an in-depth Myers-Briggs and then to keep the results handy for reference whenever interactions occur. I seeds for my career in destination marketing were planted during the first 33 months of the 1970s, while working my way through BYU in a windowless below-ground level nook of the administration building, situated next door to the dispatchers for campus police. Universities are microcosms of communities, and I’ll explain later how this was also when the seeds were planted for me about the importance of community appearance including a passion for trees. Back then we were a staff of two, then three, and later four or five of us who handled campus tours, administered the president’s box during football games and actively marketed the campus across the nation as a site for camps, workshops, summer youth conferences and events which included assisting their production. My job title was conference coordinator. The Office of Tours and Conferences back then fell under the director of University Relations, a division that fell under University Communications which had been headed until the year prior by the late Dr. Stephen R. Covey, then only 36 years old. I quickly earned a supervisory role, and following a detour for law school, this experience would anchor what would become a 40-year career as a community-destination marketing executive for communities in Washington, Alaska and North Carolina. The general idea of the then-Office of Tours and Conferences was to fuel demand for campus food services, housing and campus facilities to sustain year round employment and to engage professors and grad students during what were at the time very low volume summer school sessions. Apparently the ground-work paid off because as I graduated it was spun off and today there is an entire three story visitor center (a tower of which is shown in this blog) located at the main campus entrance devoted to tours, public affairs, alumni affairs, guest relations, reunions, community relations and even a speakers bureau etc. Up the hill north and east of Lavell Edwards Stadium is now a dedicated conference center where staff still in continuing education now coordinate and produce workshops, camps, special events and professional and association meetings. It is a long ways from that basement hovel, but the most remarkable physical transformation since I graduated is the presence now of incredible landscaping and towering trees, part of a makeover that was initiated just as I left. One of my last classes at BYU was a field botany class during the early summer session focused on trees. BYU has always been a top undergraduate research university so my professor for the class taught us much more about the value of trees than just how to identify various species. 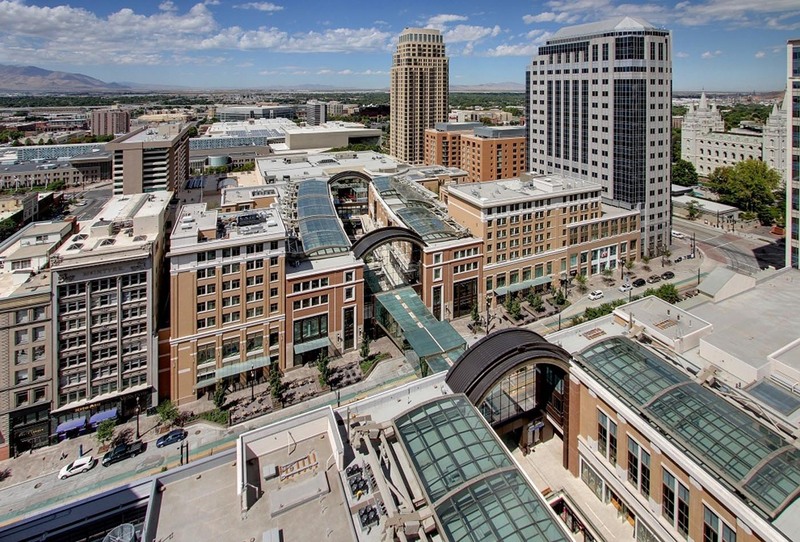 While I was growing up, BYU had undergone a tremendous building boom that had expanded the number of buildings from 6 to nearly 300 on a relatively flat plateau in the shadows of Y Mountain, a peak in the the Wasatch Range of the central Rocky Mountains. The campus was manicured and grassed but found lacking at the time in overall landscaping, especially trees. This was not lost on two other people as I graduated in August of 1972 including Roy Peterman, a classmate, and fellow-Idaho native Jack Wheatley and his wife Mary Lois who as I graduated were just dropping off their eldest son for his first semester. Peterman and I graduated from the same department, he in psychology and me in history but we each found our 40-year careers while working for the university part-time. He worked in grounds keeping becoming director in 1978, I found my calling in community-destination marketing. Both involve fostering and preserving sense of place including scenic character. The Wheatley’s are more contemporary with our respective parents. Jack was born in Pocatello, at the opposite end of the fault line of my youth. He and his late wife built a business in Palo Alto, California in residential and then commercial real estate including construction of buildings on the campus of Stanford University there. Neither had ties to BYU. He graduated from West Point and she from arch-rival University of Utah. But by the time they dropped their eldest son off to attend BYU, they had shaped a deep appreciation not just for buildings but the extraordinary value landscaping brings not only to both the built and natural environment but to human inspiration. Wheatley’s are the name sakes for an incredible Institution housed in the same building as the visitors center at BYU. In part, The Wheatley Institution’s purpose is to foster the teaching of ethical business behavior in universities. They have also single-handedly donated thousands and thousands of trees to populate the 560+-acre BYU campus along with overall landscaping inspiration and design for waterways, walkways, outdoor art and natural areas that foster learning and creativity. As a result, even though hundreds of additional buildings have been erected there since I graduated, the BYU campus has since become a spectacular example of the powerful force of biophilia on our lives. The term was coined a decade after Jack and Mary Lois began to transform BYU’s campus with trees, art and gardens. Biophia is now the well-proven concept that scenic preservation “optimizes productivity, healing time, learning functions and community cohesion” (Go Cougars!) as well as economic development. Jack Wheately’s understanding of the importance of natural and scenic aesthetics is unique among engineers, builders and real estate developers. He served during the Korean War with the US Army Corp of Engineers before achieving extraordinary financial success in commercial office building and leasing including R & D facilities in Silicon Valley. Much of this occurred in the ten years before he turned his attention to scenic preservation on BYU’s campus in the early 1970s. Maybe in part it was the influence of his wife, an art major. Maybe it came from studying the evolution of the beautiful Stanford campus, or maybe it was from meeting the needs of tech entrepreneurs who seem sensitive to the tie between creativity, innovation and natural environment. Regardless, if we could only clone Jack and infuse all commercial developers with his humility, understanding and commitment to biophilia, maybe community’s would no longer need to seek establish minimum requirements in order to protect their sense of place and environments. Something important about organizational management occurred to me a few weeks ago while watching my two grandsons, ages 7 and 9 respectively, duel it out on the incredibly realistic Madden NFL 13 video game they play on their upgraded Wii U. The video game itself offers great lessons in strategic thinking because a player’s point of view is elevated. That isn’t how it appears to players in an actual football game. It made me think of Hall of Fame quarterback, Steve Young, who my grandsons refer to now as “one of the talkers,” referring to his role as a commentator. He didn’t see a football game from the stands for the first time until long after his days as a All American at BYU and guiding the San Francisco 49ers to a Super Bowl in 1994. Young acknowledged recently that during his playing days he was only six feet tall. That’s my height – the height I used to be - albeit he was thirty or more pounds heavier. He was always listed at 6’ 2” but that was with his shoes on. He wrote recently that he couldn’t see when his receivers were open so he had to learn to throw blind, trusting that teammates such as Jerry Rice would be exactly where they had practiced on each play. I remember when my boyhood heroes, Johnny Unitas and Raymond Berry said the same thing. Unless an organization has a very simple, one dimensional mission, it is like a football team. Strategically, every individual involved must understand and execute a role so that the team as a whole functions much as though they were one person, always in synch. In fact, each team member must earn the trust of the others so that any one of them can “throw blind.” Any executive can be popular with co-workers. The real challenge in organizational management is to recruit individuals who are willing and able, and then to persuade them to surrender individual differences to earn success as a team. Steve Young is an inspiration, not just because he starred at Brigham Young University a decade after I graduated from that institution. Actually, he had been very heavily recruited by the University of North Carolina not far from where I live now. North Carolina used a run-option offense, much as Young had orchestrated during high school career in Connecticut. He had never really learned to pass except in emergencies. But he deliberately chose to attend BYU even though it was earning a reputation as “Quarterback U” due to its vaunted passing offense under Lavell Edwards. However, BYU didn’t initially have Young in mind as a quarterback when he was recruited. Virgil Carter had starred at BYU as I was finishing high school but during the years I attended the school wasn’t known for football. The only player I recall from those years was Golden Richards who went on star as a wide receiver for the Dallas Cowboys in two Super Bowls. Who could forget a name like that? Edwards, who had been an assistant coach at BYU for 16 years, took over as head coach a few months after I graduated from BYU in 1972. Beginning with Gifford Nielsen followed by Marc Wilson, BYU began an ascent as a football power, eventually winning a national championship in 1984. An All American, Wilson was succeeded by Jim McMahon who inspired one of the greatest comebacks in college football history before leading the Chicago Bears to a Super Bowl. Both set numerous NCAA records and each finished third in Heisman Trophy balloting. Young began his career at BYU ranked a lowly 8th on the depth chart behind McMahon. He set out to become a great passer, eventually succeeding McMahon and setting records of his own. He went on to win six NFL passing titles before retiring with the league’s highest passer rating following a series of concussions. He still holds the record with six touchdown passes in a Super Bowl. Not bad for a guy who started college 8th on the depth chart. All together during his NFL career, Young passed for more than 33,000 yards and 232 touchdowns while running for more than 4,000 yards and 43 touchdowns including this incredible 49-yard zigzagging run after avoiding a sack. Young’s 1990s style is epitomized today by run-option quarterbacks who can run or pass. As impressive as throwing blind is that each of his receivers at every level had to learn to catch the ball, thrown by a left-handed quarterback which means the ball was rotating in the opposite direction. I guess you could say he was a pretty good CEO too. But Young succeeded because he could trust his teammates, and they were successful because they could trust one another to each do their job in pursuit of an overall strategic goal. Trees and vegetation are retained or planted by savvy commercial developers as a means of increasing the value of their property. In Durham, NC where I live, certain standards must also be met to minimize the harmful effects of impervious surface such as parking lots. It is all about safeguarding air and water quality, part of what economists measure as ecosystem services. It is also about preserving sense of place which is crucial to leveraging economic development including tourism which in turn increases the value of commercial property. Last weekend, on my way into a restaurant for breakfast, I noticed a crew in front of an Outback Steakhouse chopping down and grinding up 10 or more large trees between the roadway and the restaurant’s parking lot. The trees had probably been planted when the property was first developed. From the location, it appeared this row of trees was being sacrificed to make the sign on the building more visible from a nearby highway. All tolled, those trees represented $1.6 million dollars in ecosystem services such as absorbing, cleansing and slowly releasing storm water polluted by impervious surface. Economists have also documented the tens of thousands of dollars that such trees each add to property values. I wondered to myself if either the restaurant or the property owner had weighed these costs and benefits as part of the decision to butcher the trees. Once the trees had been converted to chips and loaded for transport and disposal, the crews added insult by failing to be cover the trucks loaded with debris as required by law. I doubt that particular driving hazard and the resulting roadside cleanup had been factored into the decision either. Hopefully the owners will plant new trees that will grow to at least 50’ in height and canopy spread so they are able to replace the ecosystem services lost by those that were chopped down. However, I won’t be surprised if they are replaced instead by smaller varieties that are neither native to this area, nor of the same value to the community. The smaller varieties are not nearly as effective, if at all, at offsetting the impact of impervious surface. Two new studies were released last year on the value of on-premise signs. One was conducted on behalf of The Signage Foundation by researchers at the University of Cincinnati with a focus on economic value. Another deeper analysis by researchers at Villanova University focused on the effectiveness of on-premise signs as marketing devices. According to the first study, enhancing the visibility of on-premise signs is second only to redesign in popularly with business owners as a means of generating more revenue from a location. Taken together, the various changes in on-premise signs result in an average increase of 12% in sales and transactions and 10% in operating profit. So on average, making the sign for Outback Steakhouse more visible could mean an annual increase of $360,000 in sales or a tad more than 20% of the value of the trees that were sacrificed. To put this in perspective, full-cost accounting could mean that the Outback Steakhouse in Durham would reinvest a little more than $53,000 each year from those sales for 30 years back into tree-planting that would balance impervious surface in that area. The second study also found that on-premise signs are much more effective and two and a half times less expensive than outdoor billboard advertising. 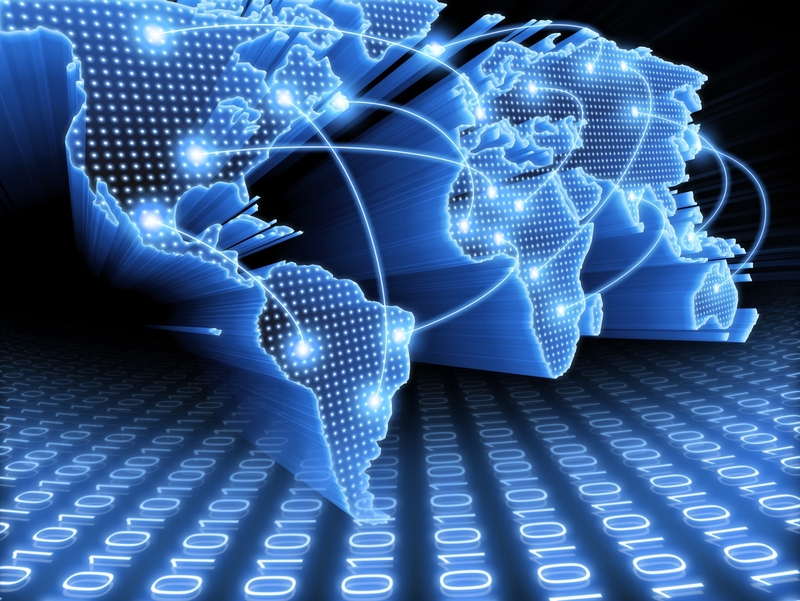 They also outperform the use of television, radio, print or the Internet as market tools. More revenue is critical to Outback Steakhouses, which under the newly created umbrella Bloomin’ Brands Inc. issued an IPO last year. Now rated the #1 steakhouse in the nation, the chain was founded in Tampa, Florida in 1988 by four friends in the hospitality business. A few months later I was recruited to jumpstart the community-destination marketing organization in Durham. Back then, Wall Street was focused on overall company growth. Today, Wall Street is more concerned about individual location revenue growth, leading Outback to permit managers, who also share in profits, for the first time to open for lunch. Not opening for lunch had been one of the pillars for the company’s culture because profits for that time period are negligible and they wanted staff to have a life outside the restaurant. Unfortunately, Wall Street hasn’t yet calibrated to full-cost, triple-bottom-line accounting and the no-lunch pillar was sacrificed for the same reason those trees were last weekend in front of the Outback in Durham. Full-cost accounting would take into account the costs generated by impervious surface, which are pushed by developers and businesses off onto government and taxpayers. Government tries to hold the line by requiring trees and vegetation to compensate but the ordinances are weak and not very well enforced. Most areas where Outback Steakhouses are built are devoid of community sense of place. I often found myself stopping for the night near one during my handful of 6,000-mile road-trips taken over the the past three years. These commercial ghettos are new, but they nearly all look identical in design, layout and architecture as well as tenants. It is too late to worry about the loss of sense-of-place that these areas create for communities but it is not too late to worry about requiring more of them to offset the costs of impervious surface they push off on the general public. 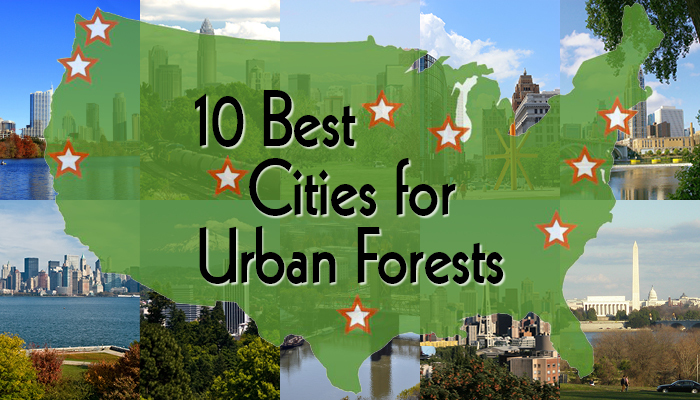 A recently released study for the National Forest Service by scientists David Nowak and Eric Greenfield, based in Syracuse, NY, has quantified both the amount of tree cover and the amount of impervious surface in each state of the United States as well as in urban and community areas overall. In North Carolina, these areas have an even higher percentage of impervious surface. Statewide the ratio of surface covered by trees compared to impervious surface has dropped to an alarming 3.3 to 1. Even more alarming is how ineffectual local and state governments are. Ordinances to bring balance to the marketplace are woefully inadequate and even more poorly enforced. Pro-market enthusiasts such as me sense the playing field isn’t balanced nor inclusive of costs. As our air and water quality and sense of place degrades, the electorate seems weary, burned out and seemingly detached. Elected officials if they are aware or care at all, seem even more so. All of this is to say that we are in desperate need of full-cost accounting. Brands such as Outback are proud of their commitment to quality of life in the communities in which they are located. What better way to demonstrate this than to dedicate that commitment to the fostering and preserving of sense of place as well as working to set an example for how businesses can incorporate full cost accounting and the triple bottom line. Charlotte, North Carolina, down-state from where I live and once practiced visitor-centric economic and cultural development has raised the bar for communities still obsessed with facilities and mega-events. Independent economic assessments, some conducted over a period of more than 30 years and looking at 50 different host communities and areas have found no discernable net impact from mega-events. So Charlotte followed the example of analysis released last summer for Indianapolis after hosting the Super Bowl and had a similar input-output analysis conducted of the impact of the Democratic National Convention (DNC) hosted there last September. Though executed by extremely reputable companies using a well-proven methodology with which I am very familiar and have used for many years and executed by individuals I know and respect, neither micro-analysis is enough to refute the earlier longitudinal analysis. These studies do, however, provide additional details. While input-output is very reliable when measuring impact over time, such as the annual impact of tourism on a community, experts caution when applying it to events of very short duration. Still Indianapolis and Charlotte are to be commended for raising the bar several notches for future hosts considering these and similar mega-events. Released last week, the Charlotte analysis of the DNC also raises some questions that weren’t probed in news reports. In fact, it took a little digging to find the actual report. Answers to these questions can better illuminate future efforts by other destination communities. 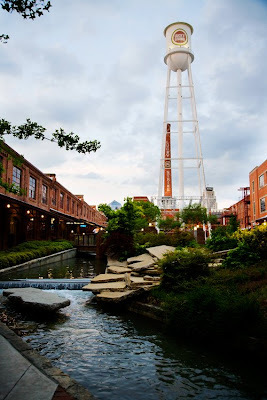 Charlotte has always benefited from superb community-destination marketing (DMO) professionals. However, a seemingly odd kind of co-dependency with business and civic officials there has made the organization seem trapped in an old-school, sales-driven and facilities-obsessed model. This is usually symptomatic of when a community becomes captive to downtown interests rather than left free to pursue the broader, community-wide objective of reaping a community’s full share of visitor-centric economic and cultural development through holistic marketing. As noted by the nation’s preeminent expert in marketing, Dr. Philip Kotler, it is rare to find even business people who understand marketing, let alone civic officials. So they often turn to sales instead of marketing or glitzy advertising campaigns, which are ironically sold by people working in sales. There was some speculation that the joint study on the DNC was conducted because the DMO had used inflated estimates to secure the event but this seems unlikely. The organization has long been familiar with the methodology used in the DNC study and has deployed it many times to measure the overall impact of visitors on that community. However, sales-driven DMOs may feel the need to override their research departments to make a proposed event appear greater than unsubstantiated estimates made by past host communities. However, more often than not, this is a result of pressure from business and government interests eager to host the event. Sales-driven DMOs are also often guilty of failing to re-calibrate the formulas used to benchmark mega-events with local variables easily obtained from their marketing research arms and various secondary studies on length of stay and spending patterns. In this day and age, there is simply no excuse for a significant gap between the pre-booking estimate of impact and the post-event analysis of a mega-event, but if there is a culprit it is most likely a combination of booster hubris and political pressure. The DNC analysis recently conducted for Charlotte is excellent and much more intricate than what was trumpeted by the news media. All but one business publication seemed to fall into the trap, possibly set by the news release, of leading with the combined figure of direct, indirect and induced impact rather than putting the focus on direct spending and noting the other impacts later in the coverage. It is natural that the study tries to measure impact not on individual counties but by lumping six counties together. Doing an analysis on each county would have been far more accurate but probably cost prohibitive. This is important because there are no regional tax structures, only county and state. The study makes a valiant attempt to estimate economic leakage and existing business dislocated by the huge event. It seems that lumping the counties made that task impossible. Would it be far more revealing to conduct an analysis on each county and then add the impacts while fully accounting for leaking and dislocation? The study notes that lodging businesses benefit the most by far and deducts 15% of those revenues for the amount redistributed to non-resident owners and for various fees. However, that is the average under normal circumstances. The huge DNC event increased occupancy by 63% over those dates the previous year and expert yield management increased the average rate for a rented room by an exorbitant 180%. According to my friends in that business, isn’t it far more likely that under those circumstances the 15% deduction from impact should be more like 30-40%? Also, is it really realistic to assume that existing visitor and resident spending was merely postponed? In my experience it is usually forgone. The estimate of direct spending includes $34.5 million in visitor-related spending and $42.2 million spent by three host organization to cover meals and upgrade facilities etc. However, since a third or more of those donations were extracted from the local economy making them unavailable for other uses there, isn’t there a case to be made that this portion should be deducted from impact rather than added to it? It is noted that many services were provided to the event in-kind by local governments including not only security for increased solid waste removal etc. Shouldn’t the dollar estimate for these services be deducted from the direct impact? Much was made by officials announcing the impact about the visibility generated by coverage of the event and the impression on delegates, news media and others attending. However, shouldn’t the estimate of this impact be adjusted by estimating what the local private donations and in-kind public expenses could have generated if invested directly by the DMO into a longer-term, more sustainable earned media campaign? There are many good reasons to host events, especially of the size that would be complimentary with existing business. But studies have long shown that mega-events themselves have little or no residual impact on community visibility and image, even if repeated every 18 months or so. Sales/facilities-driven DMOs and communities are often not open to these questions. They seem locked in a perpetual and co-dependent dance - glorifying facilities, then subsidizing mega-events in hopes of masking performance gaps. Then using these events as a rationale for an “arms race” with other communities for new or expanded facilities, all the while failing to fully exploit their community’s potential for visitor-centric cultural and economic development. This is what makes these sales-driven DMOs highly vulnerable when in turn their communities try to passively-aggressively chain them to specific facilities rather than enabling fulfillment of their community’s broader tourism interests. Once trapped in this cycle, it is very difficult to evolve instead to a far more productive market-driven approach but Indianapolis and Charlotte must still be commended for raising the bar. If others follow and the measurement of impact becomes more and more strict, it will add greatly to the measurement of the one in ten visitors who attend events such as these.